For my diploma thesis I needed an easy-to-use optimisation algorithm which could minimise a given function. I had access to Matlab, but surprisingly, none of the supplied optimisation functions seemed to satisfy my needs: I wanted to globally minimise a non-linear function within boundaries without using gradients. So I did a little research and found a Globalized Nelder-Mead method (PDF), which is a tuned version of the good old downhill simplex algorithm. Then I implemented it as a Matlab function. By the way: the function also works fine with Octave. The basic idea behind the simplex algorithm is that the worst point of is replaced by a better one with a smaller function value and to repeat this operation iteratively until a local optimum has been found. 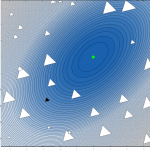 To achieve this, three different transformations are applied to the simplex which let it move in directions of descent and shrink around a local minimum. These transformations are called reflection, expansion and contraction. 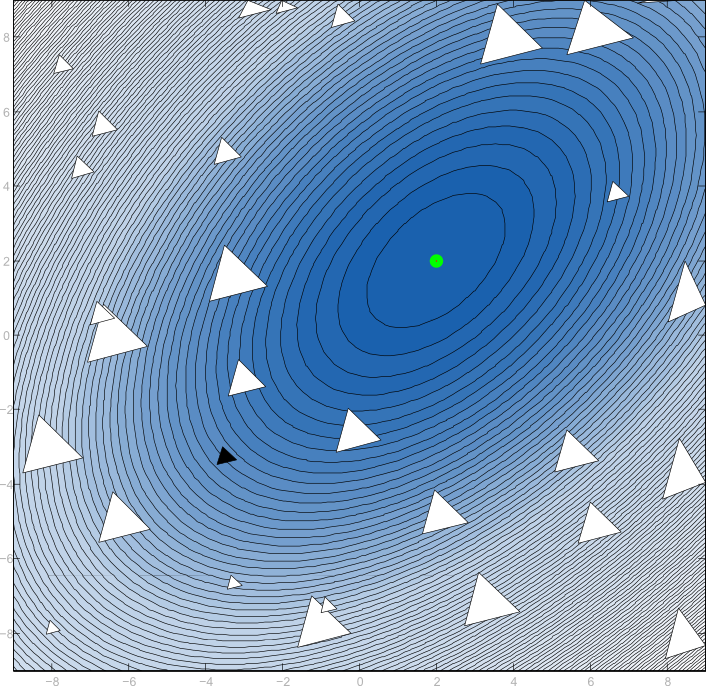 In each iteration, first the worst point is reflected at the centroid of the remaining points. Depending on the quality (good or bad) it then replaces the worst point in the simplex. If the reflected point is not better, it is withdrawn and the other fallback operations are executed. The globalized Nelder-Mead method just generalizes this idea to find a global minimum. Instead of initialising the simplex once, multiple simplices are initialised and each one finds one local minimum. There are some tweaks to make the location of these simplices better than random, but principally they are spread randomly within the allowed boundaries. Refer to the output of help gbnm and the research paper for further detail. If something remains unclear or you have found a bug, feel free to comment or post an issue on GitHub! The source has been moved to GitHub: repository ojdo/gbnm contains the function file, and a proper README file. I put the example in Matlab, but each run, the gbnm function gives me different results, for instance different x and fval. The example run should (nearly) always return the same values. Small numerical differences are to be expected, but the example I posted should always find a point pretty close to [0;0] as optimal. Can you post the exact function and values for xmin and xmax you used? the results from each run are almost the same. Ich hatte in meiner Projektarbeit auch mit (nichtlinearer) Optimierung zu tun. Vielen Dank für den interessanten Artikel. where phi is a 9×9 array. This function can be called with a 9 element column vector phiv and thus be handed to gbnm. Of course you have to reshape xmin and xmax the same way. Oh, and one remark: 9 variables is more than I ever have tried to use this algorithm for. If you get unsatisfying results, try reducing complexity by fixing some (k) of the 9 variables by setting xmin(k) equal to xmax(k). hi, i seem to be having the same problem as chris. Tebello: your function only uses `x(2)` and `x(1)`, yet your boundaries have three entries. What is `x(3)` for? And: what does not work for you? For me, gbnm finds point [1; 1; ...] to be optimal, where `x(3)` can be any value because it does not occur in the function.